The experiment Nanoparticles and Osteoporosis (NATO) is one of the nine scientific research and technology projects selected, developed and managed by the Italian Space Agency (ASI) to be part of the Italian scientific complement for the Futura Mission to the International Space Station (ISS). FUTURA is the second long-duration ASI mission (within the bilateral agreement with NASA signed in 1997) and Samantha Cristoforetti – Italian Air Force captain and member of ESA‘s Astronaut Corps – is the first Italian woman to fly in space. NATO project, that it will be carried out by Samantha Cristoforetti onboard the ISS, is focused on the development of a nanotechnology approach as a countermeasure to reduce Microgravity (MG)-induced osteoporosis. in international projects and is included in the network work with major colleges in the world. The University of Pavia promotes interdisciplinary researches and dialogues with italian and multinational companies. The company involved in NATO Project is KAYSER ITALIA, a Small Medium Enterprise (SME) (1986). It has participated to 63 Space missions with 93 payloads, all of them completed with full scientific, technical and programmatic success. The staff consists of 60 high specialized engineers. The company is certified ISO 9001. KAYSER ITALIA participated to many European Space Agency (ESA) and ASI programs, especially in the area of Life Science (biology and human physiology). KAYSER ITALIA has created ICARO, the Italian Centre for Advanced Research and Operations, located at the Kayser Italia premises. stem cells by exploring the global genic expression profile and the X-Ray microdiffraction analysis, with respect to parallel on ground experiments. The NATO experiment will be performed autonomously inside Kayser Italia’s Experiment Unit, which accommodates a culture chamber, five reservoirs filled with chemicals, a fluidic system through which fluid displacement takes place and a microcontroller board. The experiment timeline is programmed into the microcontroller board at launch site and it is performed autonomously once on board the ISS. 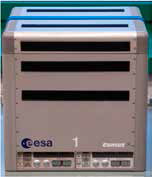 The experiment unit is accommodated into the Kayser Italia’s Experiment Container (KIC-SL) that is designed to fit into the KUBIK incubator facility in the Columbus Lab on the ISS. 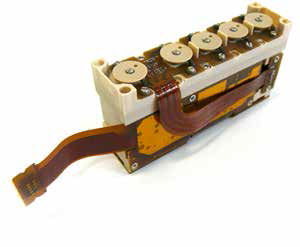 Kubik is an ESA small temperature-controlled incubator and cooler (temperature range: +6 °C to +38 °C) with removable inserts designed for self-contained automatic microgravity experiments, such as those using seeds, cells and small animals. 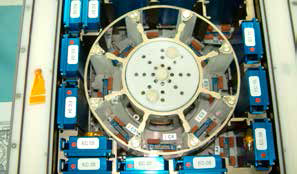 A centrifuge insert can simultaneously test in microgravity several 1 g control samples. NATO project like as the other projects of Futura Mission are making use of the outof-this-world laboratory to improve life on Earth or prepare for further human exploration of our Solar System.